Düsseldorf Airport (German: Flughafen Düsseldorf, pronounced [ˌfluːkhaːfn̩ ˈdʏsl̩dɔɐ̯f]; until March 2013 Düsseldorf International Airport; IATA: DUS, ICAO: EDDL) is the international airport of Düsseldorf, the capital of the German state of North Rhine-Westphalia. 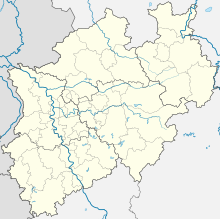 It is about 7 kilometres (4 mi) north of downtown Düsseldorf, and some 20 kilometres (12 mi) south-west of Essen in the Rhine-Ruhr area, Germany's largest metropolitan area. Düsseldorf is the third largest airport in Germany after Frankfurt and Munich; it handled 24.5 million passengers in 2017. It is a hub for Eurowings and a focus city for several more airlines. The airport has three passenger terminals and two runways and can handle wide-body aircraft up to the Airbus A380. Düsseldorf Airport is the largest and primary airport for the Rhine-Ruhr metropolitan region – the largest metropolitan region in Germany and among the largest metropolitan areas of the world. The airport is located in Düsseldorf-Lohausen. The largest nearby business centres are Düsseldorf and Essen; other cities within a 20-kilometre (12 mi) radius are Duisburg, Krefeld, Mülheim an der Ruhr, Neuss, and Wuppertal. The airport extends over a compact 6.13 square kilometres (2.37 sq mi) of land – small in comparison to airports of a similar capacity, but also a reason for Düsseldorf being known as an airport of short distances. [clarification needed] The airport has more than 18,200 employees. With 18.99 million passengers passing through in 2010, the airport was the third busiest in Germany, after Frankfurt Airport and Munich Airport, and was the 23rd busiest airport in Europe. Transfer passengers and those travelling on long-haul flights from the airport accounted for around 13% of all passengers in 2010. The first aviation event in the area was the landing of Zeppelin LZ3 on 19 September 1909 about 3 kilometres (1.9 mi) south of the present airport. The present airport was opened on 19 April 1927, after two years of construction. Deutsche Luft Hansa opened routes to Berlin, Hamburg, Cologne and Geneva. At the beginning of World War II civil use of the airport ceased in September 1939 and the airfield was used by the military. After the end of the war the airport reopened for civil use in 1948. With the area under British administration, the first flights were operated by British European Airways to RAF Northolt. In 1950, the main runway was extended to 2475 metres. In 1964 planning began for the construction of a new terminal, with capacity for 1.4 million passengers, and in 1969 the main runway was further lengthened to 3000 metres. In 1973 the new central building and Terminal B were opened and in 1975 the railway connection between Düsseldorf central station and the airport opened. The additional new Terminal A was opened in 1977. In 1986 Terminal C was opened and 8.22 million passengers used the airport, making it number two in Germany. By 1992, when the second runway was built, 12.3 million passengers were using the airport. On 11 April 1996, the Düsseldorf Airport fire, which is the worst structural airport fire worldwide to date, broke out. It was caused by welding work on an elevated road in front of Terminal A above its arrivals area. Insufficient structural fire protection allowed the fire and especially the smoke to spread fast, so these destroyed large parts of the passenger areas of the airport. Seventeen people died, mostly due to smoke inhalation, with many more hospitalised. At the time, the fire was the biggest public disaster in the history of North Rhine-Westphalia. Damage to the airport was estimated to be in the hundreds of millions, Terminals A and B had to be completely reconstructed. While repairs were ongoing, passengers were housed in big tents. In November 1997, Terminal C was completely redeveloped, with three lightweight construction halls serving as departure areas. Also in 1997 construction began on the new inter-city railway station at the eastern edge of the airport. In 1998 the rebuilt Terminal A was reopened and the airport changed its name from "Rhine Ruhr Airport" to "Düsseldorf International". Reconstruction of the central building and Terminal B began in the same year. The first stage in the "Airport 2000+" programme commenced in 1999 with the laying of a foundation stone for an underground parking garage under the new terminal. 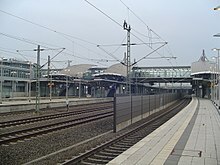 The new Düsseldorf Airport station was opened in May 2000, with the capacity of 300 train departures daily. Sixteen million passengers used the airport that year; Düsseldorf is now the third-biggest airport in Germany. The new departures hall and Terminal B were opened in July 2001 after 2½ years of construction time; the rebuilt Gebäude Ost (East Building) was reopened. In 2002 the inter-terminal shuttle bus service was replaced by the suspended monorail called the SkyTrain connecting the terminal building with the InterCity train station. The monorail travels the 2.5 kilometres (1.6 mi) between the terminal and station at a maximum speed of 50 kilometres per hour (31 mph). The system was developed by Siemens and is based on the similar H-Bahn operating with two lines on Dortmund university campus. On 12 November 2006, the first Airbus A380 landed in Düsseldorf as part of a Lufthansa promotional flight. In March 2013 the Airport received a new corporate design and dropped the phrase International from its official name. In January 2015, Emirates announced it will schedule the Airbus A380 on one of their two daily flights from Dubai to Düsseldorf starting in July 2015. In May 2015, the airport finished construction of the new facilities needed to handle the A380, including a parking position with three jet-bridges, widened taxiways and new ground handling equipment. In June 2015, Lufthansa announced the closure its long-haul base at Düsseldorf Airport for economic reasons by October 2015. The base consisted of two Airbus A340-300s which served Newark and Chicago. Newark remained a year-round service which is operated in a W-pattern from Munich Airport (Munich - Newark - Düsseldorf - Newark - Munich) while the Chicago service was suspended for the winter 2015/2016 season. A few months later, Lufthansa announced the cancellation of the Düsseldorf-Chicago route. The same route has been served by American Airlines during the summer seasons from 2013 to 2016, when it was discontinued. In January 2017, the airport's largest hub operator Air Berlin announced a massive downsizing of its operations due to restructuring measures. While some leisure routes were handed to Niki more than a dozen destinations have been cancelled entirely. In August 2017, Air Berlin also announced the termination of all long-haul routes from Düsseldorf to destinations in the Caribbean on short notice due to the ongoing bankruptcy proceedings. However, both Condor and Eurowings announced it would step in and start some of the terminated Caribbean destinations by themselves. Shortly after, Air Berlin also announced the termination of all remaining long-haul operations leading to the loss of several connections to the United States at Düsseldorf Airport. On 9 October 2017, Air Berlin announced the termination of all of its own operations, excluding wetleases, by the end of the month leading to the loss of one of the airport's largest customers. In February 2018, Eurowings announced the relocatation of all long-haul routes currently served from Cologne Bonn Airport to Düsseldorf by late October 2018 to strengthen their presence there. In March 2018, Lufthansa announced it would to close its base at Düsseldorf Airport after the 2018/2019 winter schedule which ended in March 2019. With the single remaining long-haul route to Newark was taken over by Eurowings, 400 staff members were offered a relocation to either Frankfurt Airport or Munich Airport. In November 2018, Ryanair also announced they would close their base in Düsseldorf after only a year. Their routes were taken over by Lauda. 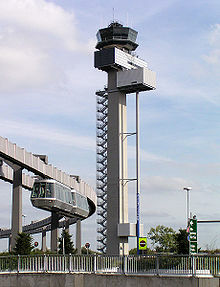 Düsseldorf Airport has three terminals connected by a central spine, even though the terminals are essentially concourses within a single terminal building. The current terminal buildings are capable of handling up to 22 million passengers per year. Terminal A was opened in 1977 and has 16 gates (A01–A16) used by Lufthansa and Eurowings, its airline partners and Star Alliance members, All Nippon Airways, Air China, Austrian Airlines, Croatia Airlines, LOT Polish Airlines, Scandinavian Airlines, TAP Portugal, and Swiss International Air Lines. Terminal A houses two Lufthansa lounges. It was refurbished fundamentally for two years after the 1996 fire. From 21 July 2016, Singapore Airlines began to use Terminal A.
Terminal B was originally inaugurated in 1973 and has 11 gates (B01–B11) used for domestic and EU-flights by a few Star Alliance members such as Aegean Airlines, but mainly by SkyTeam and Oneworld members like Alitalia, British Airways, KLM, Finnair, Iberia, and Air France. Also located within this terminal are leisure carriers such as TUIfly and Condor. Terminal B houses an observation deck and airline lounges by Air France and British Airways. After the fire in 1996 the whole terminal building was torn down and reconstructed. It was reopened in 2001. Terminal C was opened in 1986 and has 8 gates (C01–C08) used exclusively for non-Schengen-flights by non-Star Alliance airlines (except Turkish Airlines). These are long-haul flights – among others – by Delta Air Lines, Emirates, Etihad Airways, and Mahan Air. Terminal C has a direct access to Airport City's Maritim Hotel, part of a German hotel chain, and houses lounges operated by the airport and Emirates. Terminal C was the least affected Terminal after the fire in 1996. It was still reopened in 1996 after intensive maintenance works. Thus it was the only usable Terminal at Düsseldorf Airport for a couple of years. Terminal C features the airport's only parking position equipped with three jet-bridges to handle the Airbus A380. Jet Aviation operates a small terminal solely for private and corporate customers. 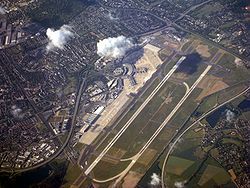 Düsseldorf has two runways, which are 3,000 metres (9,843 ft) and 2,700 metres (8,858 ft) long. There are plans to extend the 3,000-metre (9,843 ft) runway to 3,600 metres (11,811 ft), but the town of Ratingen has been blocking the expansion, as it lies within the approach path of the runway. 107 aircraft parking positions are available on the aprons. Since 2003, an area of 23 hectares (57 acres) south-west of the airport terminal has been under redevelopment as Düsseldorf Airport City with an anticipated gross floor area of 250,000 square metres (2,700,000 sq ft) to be completed by 2016. Already based at Düsseldorf Airport City are corporate offices of Siemens and VDI, a large Porsche centre and showroom, a Maritim Hotel and Congress Centre and a Sheraton Hotel. Messe Düsseldorf is situated in close proximity to Düsseldorf Airport City (some 500 m or 1,600 ft). The S-Bahn station, Düsseldorf Airport Terminal station located below the terminal. It is served by the S11 suburban line, which has its northern terminus there. The main station, 2.5 km from the terminal, is served by all other categories of railway, including ICE high-speed trains. A fully automatic suspended monorail called SkyTrain connects this station to the airport parking areas and the passenger terminals and also serves as an inter-terminal connection. The airport can be reached via its own motorway section which is part of the motorway A44 (Belgium – Kassel, Exit Düsseldorf-Flughafen) which also connects to motorways A52, A57 and A3. There are also several local bus lines connecting the airport with nearby areas and Düsseldorf city center. Düsseldorf Airport had the headquarters of Air Berlin's technical training facilities and also served as one of their maintenance bases. When LTU International existed, its head office was in Halle 8 at Düsseldorf Airport. The corporate head office of Blue Wings was also located in Terminal A at the airport. Weeze Airport, an airport 80 km (50 mi) north-west from Düsseldorf, that is sometimes advertised by low-cost airlines as "Düsseldorf-Weeze" or "Weeze (Düsseldorf)". A German court ruled the naming the airport after Düsseldorf would be misleading to passengers, however some airlines still use that name in advertisements outside Germany. ^ "Passagiere: Kumulierte Betrachtung Januar – Dezember 2018" (PDF). Retrieved 19 February 2019. ^ "EAD Basic". Euro Control. Retrieved 6 June 2012. ^ a b c "ADV passenger statistics and aircraft movements". Archived from the original on 30 November 2010. ^ a b "Flughafen Düsseldorf schließt Bauarbeiten für A380 ab". Retrieved 11 December 2016. ^ "Geo". World Gazetteer. Retrieved 21 June 2013. ^ "Willkommen bei der Landeshauptstadt Düsseldorf". Duesseldorf. Retrieved 21 June 2013. ^ a b "Emirates fliegt Düsseldorf bald mit einem Airbus A380 an". airliners.de. Retrieved 2 June 2015. ^ "American Airlines fliegt ab April täglich von Düsseldorf nach Chicago". Retrieved 11 December 2016. ^ 2016, UBM (UK) Ltd. "American adds new International routes in S17". Retrieved 11 December 2016. ^ Ltd. 2018, UBM (UK). "Eurowings adds Dusseldorf - Caribbean routes in W17". Routesonline. Retrieved 25 December 2018. ^ "Even more Caribbean: Condor starts long-haul flights from Düsseldorf". condor-newsroom.condor.com. Retrieved 25 December 2018. ^ "Air Berlin to End Flights Oct 28". Bloomberg. Retrieved 9 October 2017. ^ Hotel Düsseldorf. "Maritim Hotel Düsseldorf". Maritim Hotels Website. Retrieved 9 July 2015. ^ "Find Flights". dus.com. Retrieved 2 June 2015. ^ a b c d Liu, Jim. "Condor expands Dusseldorf network in S19". Routesonline. Retrieved 9 April 2019. ^ "Billige Flüge nach Sylt - Condor". ^ Liu, Jim. "Eurowings adds Dusseldorf – Gdansk route in W19". Routesonline. Retrieved 8 April 2019. ^ a b "New routes - Discover - Eurowings". www.eurowings.com. Retrieved 25 December 2018. ^ Ltd. 2018, UBM (UK). "Eurowings replaces Lufthansa Dusseldorf – Newark service from Dec 2018". Routesonline. Retrieved 25 December 2018. ^ Liu, Jim. "Eurowings adds Ohrid seasonal service in S19". Routesonline. Retrieved 15 March 2019. ^ a b c d e "Eurowings adds long-haul charters in W18". Routesonline. 19 March 2018. Retrieved 6 September 2018. ^ "Flights to Dusseldorf with a touch of Iceland". Icelandair. ^ a b "Laudamotion adds new Italy links from Dusseldorf in S19". routesonline.com. 9 November 2018. ^ "Airline steps in to save Glasgow Airport flight route to Germany". Evening Times. Retrieved 25 December 2018. ^ "Reisebüro PRISHTINA: Günstige Flüge nach KOSOVO, Deuschland und Schweiz - Online Buchen nach PISHTINA - Basel, Zürich, STUTTGART, München". www.flyrbp.com. Retrieved 25 December 2018. ^ Ltd. 2018, UBM (UK). "Pegasus adds Gaziantep – Dusseldorf route from late-June 2018". Routesonline. Retrieved 25 December 2018. ^ a b c d e f 2018, UBM (UK) Ltd. "SunExpress Germany S19 network additions as of 18OCT18". routesonline.com. ^ "Route network - SunExpress". Retrieved 25 December 2018. ^ "Flight Schedule". sunexpress.com. 28 October 2018. ^ a b Liu, Jim. "Turkish Airlines expands Dusseldorf / Munich network in S19". Routesonline. Retrieved 2 April 2019. ^ "ADV Monthly Traffic Report" (PDF). ^ "Düsseldorf Airport facts and figures". ^ "Route Statistics Statistisches Bundesamt". ^ "Facts and Figures Düsseldorf Airport". ^ "Passengers". dus-com1. Retrieved 2 June 2015. ^ "airberlin technik – airberlin technical training in Dusseldorf". Airberlin-technik.com. Archived from the original on 28 January 2014. ^ "Kontakt." LTU International. Retrieved 21 June 2009. "LTU International Airways Flughafen Düsseldorf, Halle 8 D40474 Düsseldorf"
^ "Contact." Blue Wings. 12 June 2005. Retrieved 30 December 2012. "Blue Wings AG Duesseldorf Airport Terminal A 5. OG 40474 Duesseldorf, Germany"
^ "Welcome to Blue Wings." Blue Wings. 27 March 2009. Retrieved on 30 December 2012. "Blue Wings AG . Düsseldorf Airport . Terminal A . D-40474 Düsseldorf . Germany"